During the summers of 2004 and 2005, I worked as a field assistant for a research group from the University of Alaska Fairbanks. We tagged humpback whales to study their movements and foraging behaviors. I also participated in research of Steller sea lions, harbor seals, fin whales, horned puffins and even some fish including Pacific cod and spiny dogfish. In 2008, I worked in Akaroa, New Zealand, studying the impacts of tourism on highly endangered Hector’s dolphin. We monitored the behavior of the dolphins in the presence and absence of swim-with-the-dolphin tourist boats to determine what effects they had on the behavior and health of the dolphins. A: Growing up on a small farm in western Washington, I spent a lot of time outdoors. From a very young age, I was fascinated by the natural world. As I grew older, I began to see all of the ways in which humans were damaging, degrading and destroying the natural systems around us. I quickly realized that I wanted to dedicate myself to a career that would allow me to address these problems. Marine science was particularly fascinating to me because we know so little about our planet’s oceans, because of the immense importance of the oceans to the health of the planet, and because this field presents many interesting and exciting challenges. A: Just after I graduated from high school, I was given the incredible opportunity to work in Kodiak, Alaska for a researcher studying humpback whales. This was my first time conducting research in the field and I was immediately hooked. For that first summer, I was an unpaid intern, but the next summer I was hired back as a full-time field technician. My time in Kodiak was a really important and transformative experience for me. It also serves as a great reminder that these types of opportunities are out there, and if you want to get involved in research it never hurts to send out some emails and make contact with researchers. A: Since working in Kodiak, I have gotten involved in a variety of different types of research. For my master’s thesis, however, I’m going back to my roots and studying humpback whales. When I was younger, I thought that we knew everything there was to know about whales. In reality, that couldn’t be farther from the truth. I am continually amazed by how little we actually know about these animals, especially considering that within recent history they were hunted to near-extinction. I think it is very important that we do our best to understand more about large whales and how they interact with their environment, especially since many species are still on the endangered species list, having never recovered from commercial whaling. 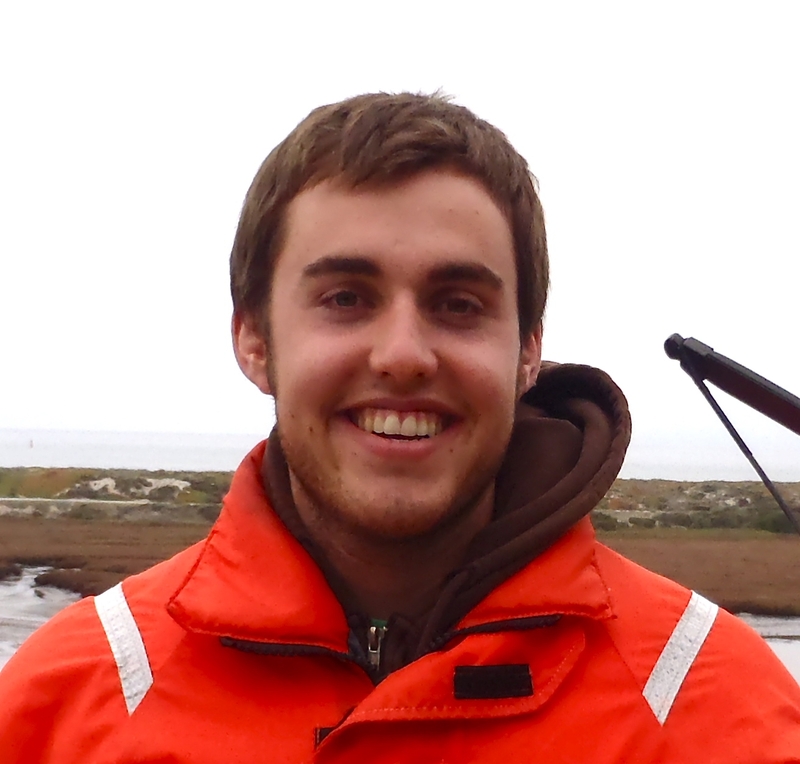 A: After finishing at Moss Landing I plan on pursuing a PhD, though I don’t know where I will do that yet. Ultimately, I want to conduct original and relevant research on large whales. That could take the form of a job with a government agency like the National Marine Fisheries Service, at an academic institution, or at a private research firm. A: For me the most rewarding and challenging aspect of graduate school is the freedom it provides. Much of the time, this can be a very positive thing. For example, having the freedom to design and carry out my own original research project has been incredibly rewarding. At the same time, this freedom can be overwhelming. I can think of any number of other interesting and important research projects I could be undertaking. Even within the project I have chosen, there is a seemingly limitless number of questions I could be asking and methods I could be using. The challenge of figuring out the best course of action from a never-ending list of options can be a little intimidating at times, to say the least. A: I think it is very important to get involved in actual research, whether it’s in the lab or in the field. There is no better way to figure out exactly what you are interested in than going out and trying a variety of different things. Each new experience helps you build your research skills, learn more about what interests you and what doesn’t, and helps strengthen your resume for job or graduate school applications. Even if it means volunteering your time for a few hours each week, nothing will prepare you for working in marine science like taking part in real research.